Due to the limitations imposed by the ice and weather conditions, anglers often need various electronics to help them fish better. One such device is the ice fishing flasher which lets you get a better idea of what is going on under the ice. Experts and novices alike can greatly benefit from the many features offered by this device, allowing them to catch more fish. Naturally, this is provided that you have the best ice fishing flasher available on the market. How Does an Ice Fishing Flasher Work? While there is no doubt about the many advantages offered to you by an ice fishing flasher, many people are confused as to how they work. So, the first thing that I am going to do is to break down how such a device works. Flashers utilize sonar technology to be able to find the depth of solid objects such as the bottom of a lake and fish. This basically means that sound waves are used to measure distance under the water. Now, the most important parts of a flasher that you need to know about is the power pack, transducer, and the screen. The power pack of a flasher emits bursts of electrical energy to the transducer which, in turn, converts it to sound waves. This high-frequency sound is sent out in a cone shape to the area directly beneath your ice fishing hole. The diameter of this cone is usually about one-third of the total depth of the area that you are in fishing in. So, for instance, if you were fishing in a spot that is 20 feet deep, the diameter of the cone would be over 6.5 feet. Once the transducer has emitted the sound signal, it then begins to act as a microphone. It is then responsible for picking up the ‘echo’ that is bounced back from any object that the sound waves would have collided with. This signal is then transmitted onto the flasher screen as a different colored light blip. The longer a fish is within the cone of the flasher, the thicker the blip shown. If you are just getting started out with ice fishing, you may wonder if you even need an ice fishing flasher. Well, to answer this, you should consider some of the benefits that come along with this device. Now, one of the main disadvantages of fishing on a frozen lake is that you can’t see anything below the ice. This means that you are often flying blind, unable to tell if there are any fish where you have drilled your holes. A flasher can help you out here. See, it will be able to tell you when a fish enters the water column directly below your fishing hole. Better yet, the device will let you know if a fish is ascending from a greater depth, towards your lure. So, you will actually be able to predict a bite before it happens. It isn’t just fish that a flasher can help you detect. It also works to locate other elements such as drop-offs and vegetation. During the wintertime, these are areas that fish like to congregate. So, by locating such spots, you can improve your chances. I have already mentioned that the transducer is an important part of your flasher. Thus, you will need to ensure that the transducer that comes along with the device is quite good. One of the first things that you will need to determine is whether to go with a high frequency or low-frequency transducer. This is more about where you are fishing rather than anything else. For deeper waters, a powerful low frequency is best while in shallow waters, you will find a high frequency to be most helpful. Now, with low frequencies, you do have the benefit of being able to cover a greater area around your fishing hole. At the same time, it can be difficult to distinguish between two close objects (for example, fish) with this frequency. So, you will need to decide which feature is more important to you. The next thing to consider is the transmitting power of the transducer. Simply put, the greater the power, the better your chances while ice fishing. The power of transducers is measured in watts. The main purpose of having a flasher is so that you are able to translate the data that is presented to you on the screen. To be able to do this, you will need a high-resolution screen so that each piece of information is plotted distinctively. This makes it easier for you to be able to interpret the readings. When it comes to how the data is shown, you will find variances across price ranges. So, the cheaper options will often have more basic screens at data. This, however, is not necessarily a bad thing as it can make it easier for you to pick up on fish location more quickly, particularly for beginners. Last but not least, you should focus on the size and the weight of the flasher. After all, you will have to lug it across an icy surface, along with your other equipment. Just make sure that you take the device and the battery pack into consideration together when thinking about the weight. In this instance, you will be better off with a smaller yet more powerful battery pack. Before you head out to your favorite spot, make sure that you know the depth of the area. This way, you will be able to fine-tune your device more effectively. Once you are aware of the depth, you should set the range to the closest depth after the actual depth of the spot. Therefore, if you are fishing in an area that is 18 feet deep, have the range at 20 feet. The next thing you will have to do is to match the gain to the depth of the water. The gain is simply the level of power that the transducer emits and you will need more of it if the water is quite deep. A good way to figure the right gain is to increase it until you begin to notice interference and then dial it back until the screen is clear. 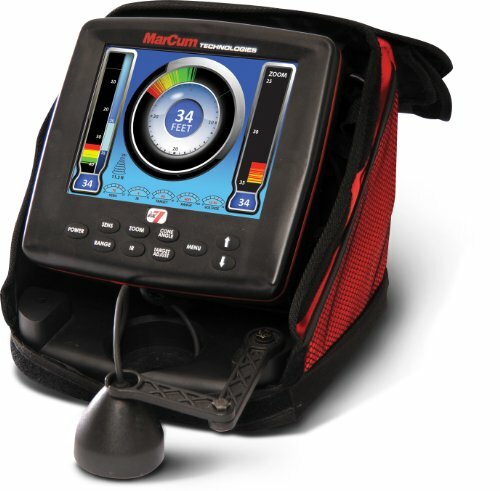 As far as sonar devices go, the Marcum LX-7 is definitely a leader among them. This is largely to do with the benefits that go along with the incredible power offered up by this machine. To start with, the dual beam transducer shows you the area directly below it in either an 8 degree or 20 degree cone. At 4800 watts, the power output is excellent and allows you to reach depths of about 300 feet below you. The response on the sonar system is also quite quick and you can expect results back in less than a second. The only thing that you have to remember with this model, though, is that the transducer should be placed as close to the water as possible, rather on top of the ice. The machine doesn’t get proper readings through the ice. One of the things that push the LX-7 ahead of the competition is the LCD screen. It is large, has excellent resolution, and even comes with zoom-in features. All of this makes it a lot easier to understand the readings on the screen. The other feature that I really enjoyed about this model was the half-inch target separation – it is quite simple to distinguish between close moving fish this way. 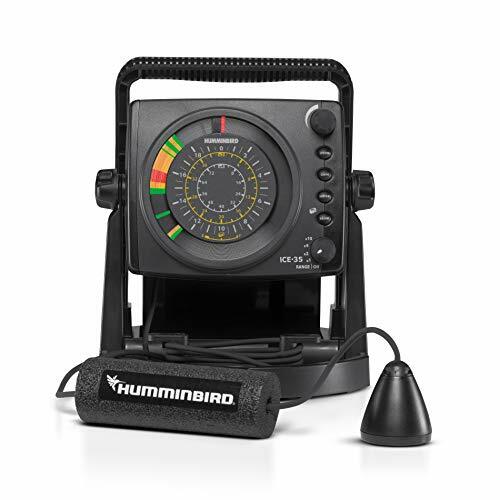 If you are looking for a budget version or are still experimenting with flashers as a novice ice angler, then the Humminbird ICE-35 is the best option for you. Now, due to this price point, you get a rather simplistic design without many of the advanced features of more expensive models. That being said, this flasher works incredibly well within its limitations. The power output on the flasher is quite good and you should be able to receive results from up to depths of 200 feet. Since you are unlikely to be fishing in waters that are deeper than this, the ICE-35 works well for a variety of environments. I like that with this flasher, you can actually rely on the readings that you are receiving. It is a dual beam flasher which means that you are getting a lot more information to go off on. The zoom feature is also an added benefit, especially for a flasher that can be considered in the budget range. Speaking of which, the resolution on the screen is also quite good and it is easy enough to see the readings, even in bright sunlight. My primary issue with this flasher is the fact that it has to be assembled, which can take a while, particularly if you aren’t tech-savvy. Vexilar is arguably one of the more popular flashers among expert anglers and thanks to the FL-8se Genz pack, it isn’t difficult to see why. The one thing that really stands out about this model is its durability. Not only is the flasher meant to work in icy and snowy conditions, it has been built to last for years on end. So, you can be quite sure that this is a companion that you will be lugging around for quite a while. Of course, this means little if the device isn’t reliable. The good news is that the FL8se definitely is. With a power output of 400 watts, the flasher is able to scan up to 120 feet. Even better, it has adjustable depths allowing you to get readings starting at 20 feet! The target identification is also not too shabby at one inch. At the very least, you will have no trouble with medium sized fish. The FL-8se is a good option if your favorite ice fishing spot tends to be busy during the season. The device is able to prevent interference from other nearby flashers so that your own readings aren’t affected. While the Vexilar works well in snowy conditions, you may have a bit trouble trying to view the screen in bright sunlight. 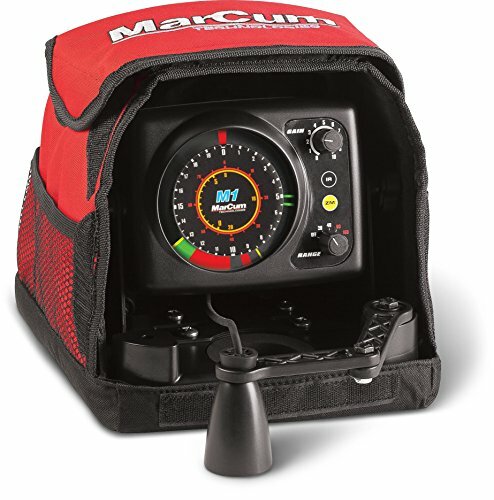 The Marcum M1 is best described as an entry-level flasher. This is both due to the price as well as the overall design of the device. The good news for novices is that this flasher has an incredibly low learning curve. See, while the M1 might utilize the latest technology, the user interface is rather old-school. In this case, it isn’t a disadvantage as it cuts down on how long it takes you to figure out how to work the flasher. Now, this flasher may not have all of the bells and whistles that you typically expect with the modern flashers. However, it is not lacking in any way. You get the basic features such as zoom so that you can focus on a particular area in the water. There is even a button to help you prevent interference if you are around other anglers. One of my favorite features on the M1 is the cable that is held up by an arm. The arm is extendable just enough so that the cable can reach the bottom of your fishing hole without actually touching the water. The other thing that I appreciate is the long battery life as well as how easy it is to charge this flasher. The one thing that you will be able to appreciate almost immediately about the ICE-55 is that it comes with its very own soft pack. Now, if you have ever had to make a trek from your car to your fishing spot, carrying all of your equipment, you know just how handy a carrying case can be to protect your flasher. This is also a good option for anyone who wants to simply glance at their screen and be able to deduce what is going on below the surface. This is a no-fuss, no-frills flasher but it works well like this. The ICE-55 lets you get readings up to 200 feet and has both manual and auto depth readings. While the manual option works like a dream, there are some issues with the auto option and you can get fluctuating readings. 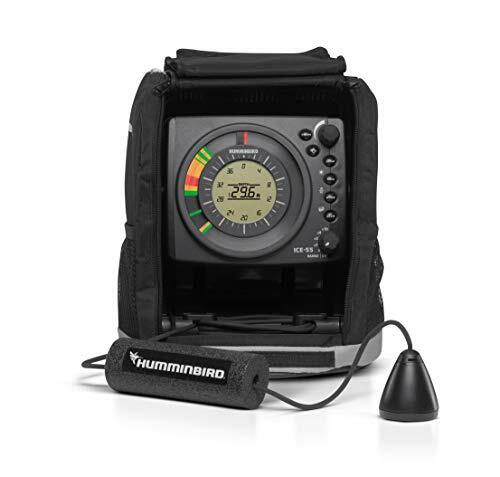 The Humminbird ICE-55 is able to eliminate interference quite well so it is suitable for crowded spots or even tournaments. The other perk with this flasher is the zoom feature which is adjustable. So, you get to choose just which aspect of the water column that you want to hone in on for better results. Crafted from the highest quality material to ensure quality and durability. Perfect for outdoor use like hunting, camping and fishing. 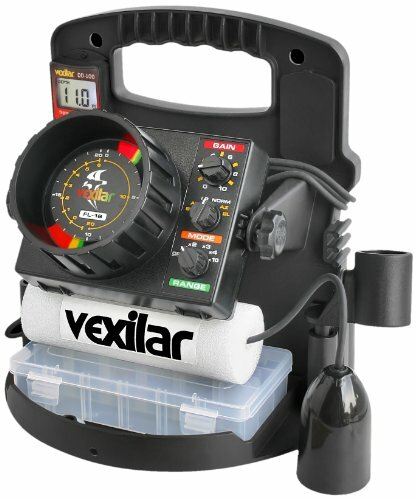 The Vexilar FL-18 is definitely a pricier option but it is still one of the best flashers that you can buy. Why? Well, this is because of the abundance of features that you get. My favorite, in particular, is the split screen display design. This way, you can zoom in on the water column on one side while still being able to monitor the whole column on the other. You will not be letting any fish escape with this option. Then there is the fact that it is equipped with shallow water mode that works for depths of less than 15 feet. This gives you a better idea of where the fish are at all depths so that you can switch up your lure position accordingly. The FL-18 also has a target ID of less than half an inch! This really makes it quite easy to distinguish between two fish that are swimming in close proximity to one another. 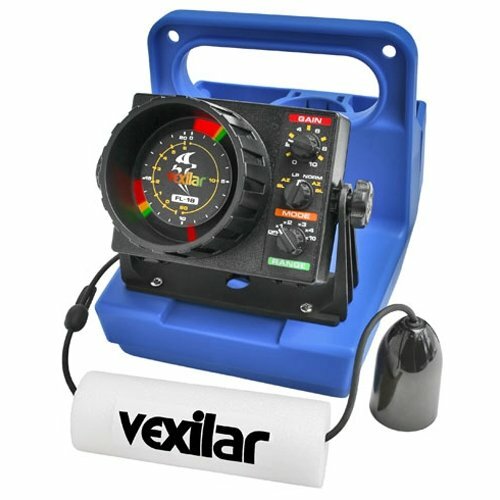 You will be able to get depth readings for up to 200 feet with the standard model. Last but not least, since this is a Genz Pack, you get a really durable flasher that really can withstand most weather and environments. So, which of these are you most likely to be successful with? Well, the experience would warrant that I choose the Vexilar FL-8se Genz Pack here. For the price that you pay, you get a durable, long-lasting flasher that will continue to be reliable throughout the years. Its adjustable depth also means that you get to decide which part of the water column that you want to focus on so that you will have better luck with the fish biting. It is also able to work well even with other finders around, making it ideal for tournaments or just a busy ice fishing spot. This concludes the best ice fishing flasher guide and review. Hopefully, you will find one that is perfect for you.